Aluprof with a triple gold! | ALUPROF S.A. The Gold Champion of the Year 2018 and double title of Gold Construction Brand 2018 went to the Aluprof company, the Europe’s leading manufacturer of aluminium systems. The brand received the prestigious distinction in the following categories: Aluminium window profiles and roller shutter systems. The winners were selected in a plebiscite conducted by ASM Market Research and Analysis Centre. The ranking of Construction Brand of the Year is the only research project in Poland with such a wide range and independent character, based on authentic indications of contractors. The effect of the survey is an annual ranking classifying construction materials produced in Poland. In the latest 14th edition, Aluprof won the two highest titles: “Gold Construction Brand 2018” in category Aluminium window profiles and “Gold Construction Brand 2018” in the category Roller shutter systems. In addition, the brand from Bielsko-Biała received a special distinction, the Title of “Champion of the Year 2018” in category Aluminium window profiles, awarded to companies which have obtained users’ recognition for many years. “The results of this year’s edition of Construction Brand of the Year Report are for us the crowning achievement of the entire Aluprof team and the confirmation that the goals have been implemented once again. We are the leader on the aluminium and roller shutter systems market. 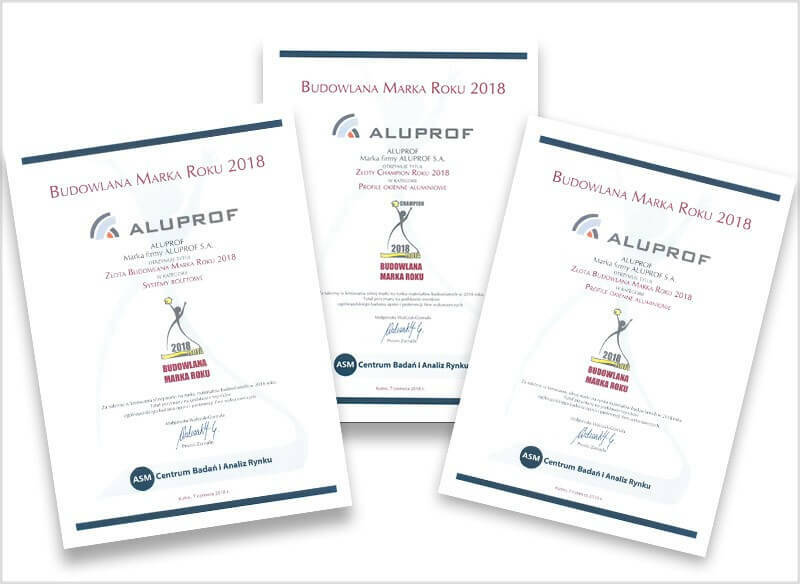 This distinction is all the more prestigious because contractors who work daily with products of various companies have indicated Aluprof products as the best ones” says Bożena Ryszka, Marketing Manager at ALUPROF S.A. The organiser of the ranking is ASM Market Research and Analysis Centre, which conducts nationwide surveys among contractors to find out their opinions on several dozen product groups of building materials. The survey is based on spontaneous indications of respondents who make assessments according to criteria of frequency of brand use, the highest quality available on the market and the best value for the money. The Construction Brand 2018 Gala took place on 7 June at the Venecia Palace hotel in Michałowice near Warsaw. Awards on behalf of the Aluprof company were received by Bożena Ryszka, Marketing Director of ALUPROF S.A.